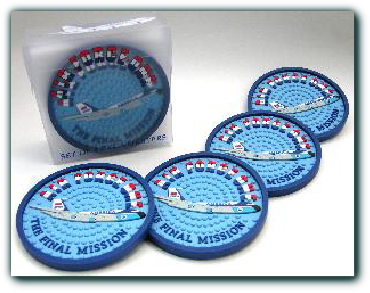 The Final Mission Drink Coaster set is made up of four coasters depicting Air Force One 27000. They are made of durable, waterproof, non-slip PVC. They are washable and perfectly safe for any fine furniture surface. Comes in a re-usable collector’s storage box, which proudly tells the story of this Air Force One on the back.